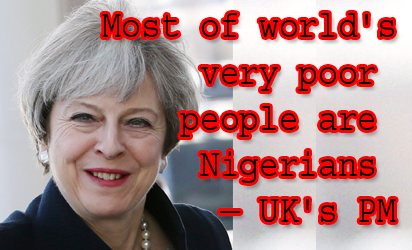 British Prime Minister, Theresa May, said yesterday that Nigeria is the home of the highest number of poor people in the world. She spoke on a day the Vice President, Prof. Yemi Osinbajo, said at the ongoing conference of Nigerian Bar Association, NBA, in Abuja that the Federal Government was committing the sum of N500 billion into wealth creation and poverty alleviation. Speaking in Cape Town, South Africa, where she is currently on a state visit, the Prime Minister said Africa is home to a majority of the world’s fragile states, and a quarter of the world’s displaced people. According to her, Africa has the highest number of poor people in the world, and that 87 million Nigerians are living below the poverty line of $1 and 90 cents per day. May’s statement is also coming months after the Brookings Institution named Nigeria the poverty capital of the world, overtaking India, a country with a total population of about 1.3 billion people. “Much of Nigeria is thriving, with many individuals enjoying the fruits of a resurgent economy, yet 87 million Nigerians live below $1 and 90 cents a day, making it home to more very poor people than any other nation in the world,” Prime Minister May said. She said achieving inclusive growth is a challenge across the world, adding that Africa needs to create 50,000 new jobs per day to keep employment rate at its current levels till 2035. The prime minister, who will be visiting Nigeria later this week, said she wanted the UK to become the biggest G-7 investor in Africa by 2022, building around shared prosperity and shared security, adding that a healthy African economy is good news for the UK. ‘Our aid programme must work for us’ She said: “I am unashamed about the need to ensure that our aid programme works for the UK Today, I am committing that our development spending will not only combat extreme poverty, but at the same time tackle global challenges and support our own national interest. “It is in the world’s interest to see that those jobs are created to tackle the causes and symptoms of extremism and instability, to deal with migration flows and to encourage clean growth.” The UK has one of the biggest overseas aid programmes in the world, expending $18 billion on aid overseas in 2017 alone. Seven Nigerians descend into extreme poverty every minute At a press briefing on Nigeria Poverty Profile Report 2010, the Nigeria Bureau of Statistics, NBS presented Nigeria’s harmonised living standard surveys for 1980, 1985, 1992, 1996, 2004 and 2010 . According to the report, the percentages of the Nigerian population living under extreme poverty were as follows: 1980 (6.2 per cent), 1985 (12.1 per cent), 1992 (13.9 per cent), 1996 (29.3 per cent), 2004 (22 per cent) and 2010 (38.7 per cent). In 2015, the World Poverty Clock of the World Data Lab in Vienna, Austria stated that 42.4 per cent of Nigerians were living in extreme poverty and in June 2018, the figure was 44.2 per cent. Living in extreme poverty as defined by the World Bank is living under $1.90 (N680) per day. People living in extreme poverty are unable to meet their minimal needs for survival. In 2015, the UN set up the Sustainable Development Goals, and the first of them is to “eradicate extreme poverty for all people everywhere by 2030”. However to achieve this globally,90 people need to leave poverty every minute to eradicate poverty totally by 2030; and to achieve this in Africa, 57 people have to leave every minute; and in Nigeria,12 people per minute. Currently, the reverse appears the case in Nigeria. Reason: On the average, seven people descend into poverty every minute. FG committed N500bn to poverty alleviation — Osinbajo Meanwhile, Vice President, Yemi Osinbajo said yesterday that the Federal Government was putting N500 billion into wealth creation and poverty alleviation in the country. Osinbajo, who disclosed this during the question and answer session of the 58th Annual General Conference of the Nigerian Bar Association, NBA, yesterday at the International Conference Centre, Abuja, said it is in recognition of the menace of poverty that the Federal Government rolled out the National Social Investment Programmes, NSIP, to improve capacity and alleviate poverty. He said: “We started off in 2016 looking at a budget that was crafted differently. All along, if you look at the way we have approached economic policies, it has always been the case of top-down approach. “So, we looked at how to improve industry; how to improve manufacturing; we looked at how to give loans to Micro Small and Medium Enterprises, MSMEs. “The approach we adopted in 2016 was first to create a safety net; so we, for the first time, put in the budget a line for what is called NSIP; that is N500 billion for NSIP and that is the largest of its kind in the history of the country. “The N500 billion covers conditional cash transfer to the poorest; one million of the poorest; we work with the World Bank for special coverage to determine the beneficiaries.” He said the Federal Government targeted five million poor people but was hindered by scare resources. The vice-president said 500,000 graduates had been employed under the N-Power scheme which was a part of NSIP for providing jobs to graduates. He also listed TraderMoni scheme which was a micro-credit scheme aimed at empowering two million petty traders. According to Osinbajo, one way of checking poverty is to incrementally improve capacity and put money in the hands of the poorest which is what NSIP is doing. Osinbajo, who noted that there was need for strong institutions to make justice system effective, also said: “The government is frequently criticised for not being able to secure convictions; there are those who say the prosecution is not prepared, there are those who say the defence is engaging in dialectic tactics. “There are those who say the judiciary is slow or the judiciary is compromised; but all of these have to do with our administration of justice system and we are very much a part of it. “There is a sense in which we must accept responsibility for the discipline of lawyers; dialectics is part of our system; so, I think it is beyond government. “Strong institutions such as the NBA need to rise to the occasion and it really calls for self regulation; government is not going to make the laws to change that.” He said the stakeholder should not allow a situation where the administration of justice system became ineffective because if it did, building a moral society would be undermined almost entirely. Earlier in his remark, the Outgoing NBA President, Abubakar Mahmoud, described Osinbajo as a pillar of support to the association. He said that the vice-president had been exemplary, adding that the NBA was proud of him.